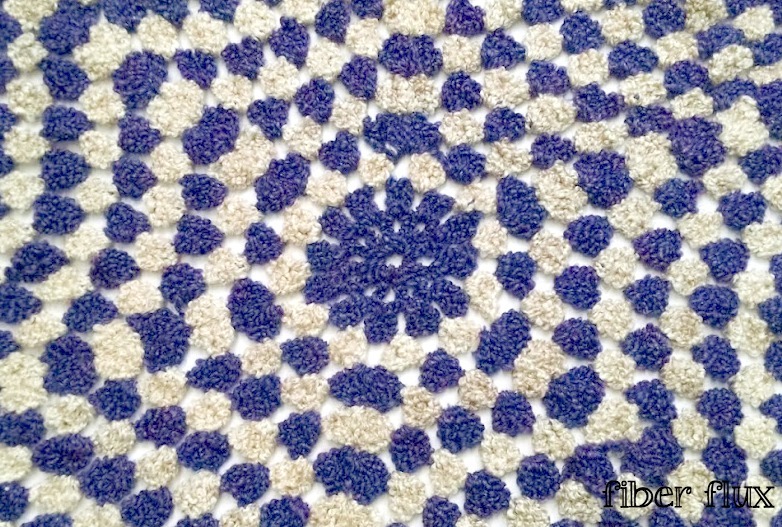 Fiber Flux: Free Crochet Pattern...Violet Clouds Throw! 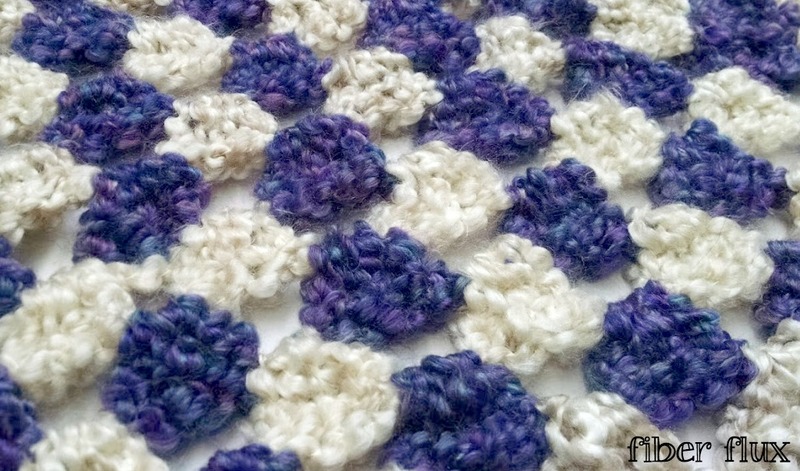 Free Crochet Pattern...Violet Clouds Throw! 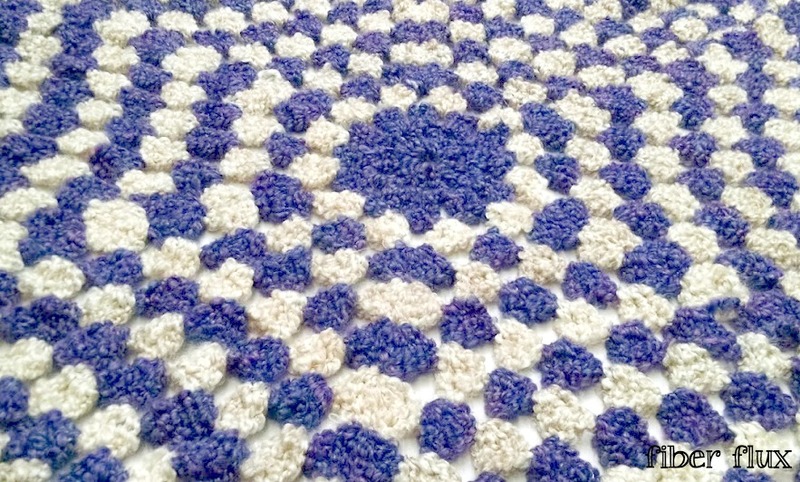 The Violet Clouds Throw is super cuddly, soft, and light as a cloud. 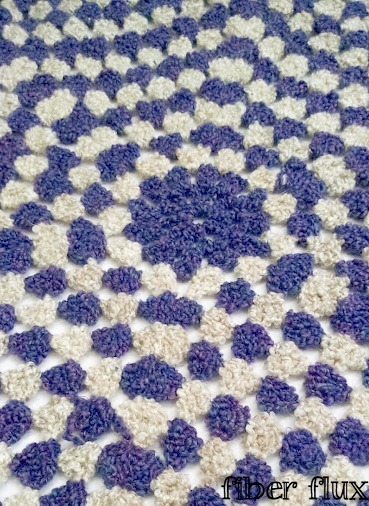 It is fast to work up in a simple hexagon shape and make a great accent blanket in any room. I made mine in a smaller "lap-ghan" size, but you can make yours as large as you like by simply working more rounds. 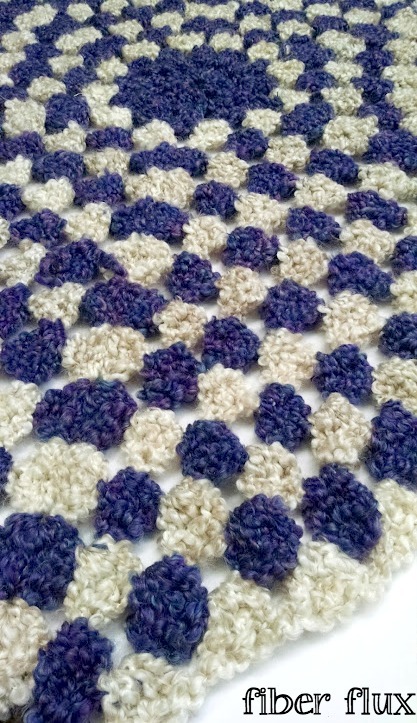 Each row after: alternating rounds of cream and purple. Chain 4 and join into a ring with a slip stitch. Round 1: Chain 4 (counts as a dc), then work (a dc into center of ring, chain 1) 11 times. Join to close with a slip stitch. 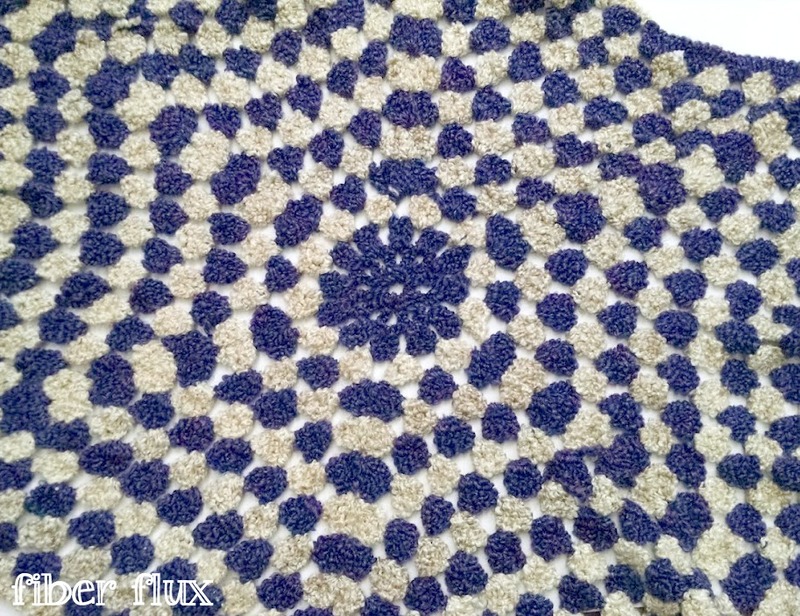 Note: If you want to make round 2 in the same color, simply slip stitch until you reach a ch 1 space and keep going. If you want to switch colors...cut yarn and join the new yarn at one of the ch 1 spaces and tie securely. Round 2: Chain 4 and work a dc in the same space. 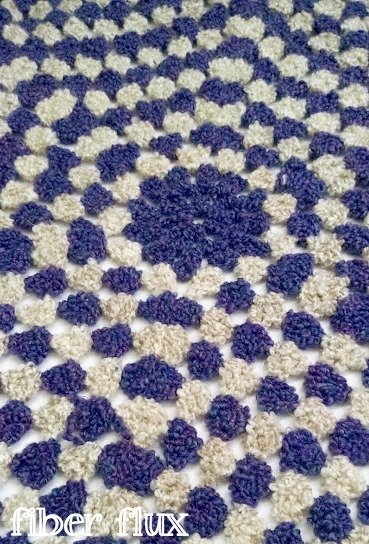 Chain 1, then work two double crochet in the next (chain 1) space. Keep doing this all the way around, working 2 dc in each space, then a chain 1. Join to close with a slip stitch. Round 3: Chain 4, then work 2 dc in the same space, then chain 1. In the next space, work three dc, then chain 1. Keep doing this all the way around the circle...3 dc, then a chain 1 in each space. Join with a slip stitch to close. Round 4 (circle becomes hexagon in this round): Chain 4, and in the first space work 2 dc, chain 1, then 3 dc all in the same space. This creates the first hexagon corner. In the next space, to work the hexagon side, chain 1, then work 3 dc in next space. Keep going in this manner, working a corner of two "clusters" and a side of 1 cluster (each cluster being separated by a chain 1). Join with a slip stitch to close. Round 5: round 5 is similar to round 4, but with a sequence of a corner, then a side, then another side. Begin with a chain 4, and in the first space work 2 dc, chain 1, then 3 dc all in the same space. In the next space, to work the hexagon side, chain 1, then work 3 dc in next space. In the next space, chain 1, then work 3 dc. Keep going in this manner, working a corner of two "clusters" then a side of 1 cluster, then a side of 1 cluster (each cluster being separated by a chain 1). Join with a slip stitch to close. Repeat round 5 until the throw is a large as you want it to be. This is so gorgeous ! I love it ! Thank you ! You're very welcome and thanks for your kind comment! How many rounds did you do for the lapghan? I believe it was 16...gave it as a gift and she said it was the perfect size for her lap!